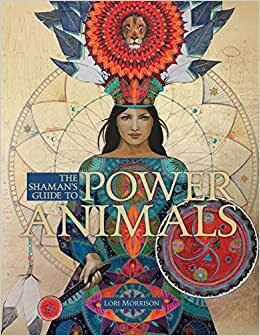 Start reading The Shaman's Guide to Power Animals on your Kindle in under a minute. “Lori Morrison has a profound connection to the spirit world that is evidenced in the contents of this book. She sees between the worlds and knows how to speak to the spirits of the animal nation. She then takes this gift and titrates it into usable form for the reader to glean insightful messages from the spirit world. Her book gives an analysis of the physical natures of numerous animals and interprets the meaning of the animal for persons who might encounter them in their spiritual journey. The encyclopedic nature of the work allows for easy reference to scientific fact and metaphysical attributes. As a reference guide it is a valuable assistance to the reader to discover deeper awareness of the messages that animals embody. Lori Morrison is a best-selling author, inspirationalist, and mystic. She became part of a rare community of lightning shamans due to a spontaneous awakening of shamanic knowledge by natural force. Her first teachers were Mayan ancestral spirits who took her through a two-year initiation. During this period, she was introduced to four Jaguars who became her guides. Later, through an important ceremony, a Haitian shaman retrieved a powerful Lioness for Lori that she collaborates with to this day. These sacred relationships with Power Animals have enriched her life and spiritual journey. Lori is now honored to deliver messages from the spirits of over 200 different creatures to you. Lori makes her home in Sedona, Arizona, where she has a successful practice dedicated to healing through vibrational medicine. 1.0 out of 5 starsNOT NEARLY AS COMPREHENSIVE AS OTHERS ON SAME SUBJECT. Odd that a woman who claims to have 4 black panthers following her around as power animal/totem animal did not give more information on Black Panthers. For a truly elaborate and definitive source read “Animal Speak”, by Ted Andrew. Chapter 13, and you’ll find the quintessential knowledge on the Black Panther as Power Totem - as well as equally brilliant exposes on the other animals listed. I cannot help but sense Andrews’ work was research material for Morrison’s book - while the latter is not nearly as comprehensive. Also - to get some TESLA-based read on which is YOUR PERSONAL totem/power animal is over the top PR MANIPULATION at its best/worst. I’m giving it a go - as fully aware of my totem animal..... see what comes up. It costs $20, and based on birthdate and where born.... and some Tesla deal. The woman admits SHE KNOWS HOW TO MAKE MONEY....always has. I am a believer. 5.0 out of 5 starsLori is an incredible author and healer! Such a fantastic book I’ve enjoyed every of each power animal. I had to send it to all of my friends. My power animal is an opossum! Not what I would have thought but the description says: intuitive, fearless and drama and that sums me up perfectly! I highly recommend this book and I suggest you read her other book: Lori, The Disintegration of My Ordinary Reality. Lori is an incredible healer! If you have tried everything and nothing is working, whatever the illness or problem may be, I strongly encourage you to contact her to begin your journey to quantum wellness ! 5.0 out of 5 starsAnimal enthusiasts will love this book! Lori has done an excellent job capturing the essence of the many, many animal profiles included in this book. I know I will be referencing it often as I see so many critters every day! I appreciate the guidance she has given us as we try to travel on our worldly paths. Very disappointing as there is no acknowledgment of Shaman Maya Starhawk’s contribution to this book. I pre-ordered my book back in February and received it in a timely fashion after its release date. It was a pleasure to converse with Lori Morrison when it came to inquiring upon my order. It was also a great feeling to open the book to her personal message, autograph, and to my power animal, Bobcat! It is a well-written softcover book with lovely illustrations. I especially love the cover art! So far it has helped me validate my own personal visions, dreams & spiritual connections I have with certain animals. (Bobcat for sure fits with who & how I am). As someone who walks a deep spiritual path and has psychic abilities, knowledge about shamanism and working with power animals helps me progress further in this lifetime. I am happy I came across Lori Morrison, through the Healing Crystals Facebook page, and that it led me to owning her book. It will definitely always be a guide and my go-to when an animal spirit comes to visit. Thank you!